They say it’s always 5 o’clock somewhere, but given Chicago’s boozy history, we think it’s fair to say that it’s always 5 o’clock in Chicago. 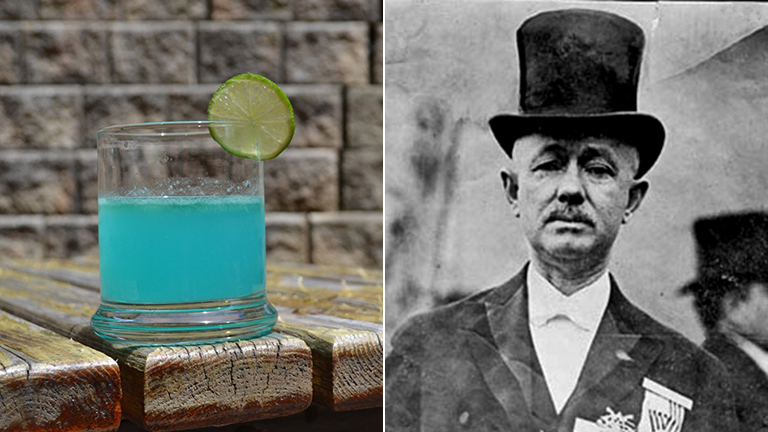 That’s why this summer we’re raising a glass to the Chicago spirit each Friday by sharing original cocktail recipes that celebrate some of Chicago’s most colorful politicians. Belly up to the bar and get a little taste of Chicago’s spirited history. Find all of our drinks here. The taciturn and canny saloon owner Hinky Dink – who was, ironically, a teetotaler – served as alderman of Chicago’s 1st Ward from 1896 to 1923 alongside “Bathhouse” John Coughlin. The pair grew up together in “Conley’s Patch,” an Irish neighborhood around Monroe and Wells, where a young Kenna sold newspapers and reportedly got his short-stuff sobriquet from publisher Joseph Medill. As aldermen, they lorded over the red-light Levee district, where office buildings stood alongside saloons and brothels. They also ran the debaucherous First Ward Ball, a wild, boozy revel that drew policemen, prostitutes, pimps and politicians by the thousands. At the 1896 First Ward Ball, Kenna exclaimed, “It’s a lollapalooza! All the business houses are here, all the big people.” He didn’t know how right he was: A decade later, the First Ward Ball had grown so large that it had to be moved to the Chicago Coliseum. Not long after that, it had grown so raucous that the city shut it down entirely. Hinky Dink might’ve been a teetotaler, but this cocktail ain’t no sissy drink. We start with amber rum that would’ve been right at home in Kenna’s saloon, The Workingman’s Exchange. It gets Hinky Dink-style bite from ginger and lime, smoothed over with silky orgeat. Overproof Jamaican rum floats on top and mixes a little business with pleasure. And we serve the Hinky Drink up in – of course – a short glass. Now you’re ready for a lollapalooza of your own. Cheers! In a cocktail mixer filled with ice, shake all ingredients but the Jamaican rum and strain into a rocks glass. Float the Jamaican over the top using an upside-down spoon. Garnish with a lime round.